(1) On Feb. 4 the La Jolla Historical Society (LJHS) and the La Jolla Community Planning Association (LJCPA) each filed appeals against the city’s environmental determination on the Windermere cottage. Astonishingly, the appeal filed by the LJCPA’s Chairman, Mr. Tony Crisafi, was “word for word identical” to the appeal filed by the attorney for the LJHS…..? Mr. Crisaif filed the LJCPA unauthorized appeal three days prior to conducting a public noticed meeting, public discussion or public vote by the LJCPA Trustees, once again in deliberate violation of the Brown Act, City Council Policy 600-24 and their own City approved March 2009 bylaws. In fact, at their February 7th meeting, when attempting to retroactively approve the already filed appeal, the Chair of the LJCPA did not disclose any outside meetings, conferences or consultation regarding the clearly “ghost written” appeal that was filed, nor did any Trustee of the LJCPA even bother to ask why the Environmental Decision was being appealed, or the grounds to agree to such an appeal. 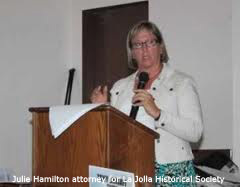 (2) The LJCPA ratified their Chairman’s illegal February 4th appeal at their February 7th publicly noticed meeting; they did not ratify the La Jolla Historical Society’s appeal. (3) The La Jolla Association (LJA) is a grassroots community group advocating for creditable representation in our community. LJA is not critical of the LJCPA’s autonomy in advising the city on planning issues, as stated in your paper. Our group is only critical of the LJCPA leadership that uses our community group to promote their own self-interest. If they do not get their way they hide behind obscurely named community groups such as; Save La Jolla, La Jolla Shores Tomorrow, No Third Story, Taxpayers for Responsible Land Use, etc… while being directed by the same attorney, the one that wrote the above mentioned appeals. LJA supports the effort of the majority of the LJCPA Trustees who are well meaning community volunteers that donate many hours for the betterment of our community. (4) The fact is the La Jolla Association has not taken a position on this project we only want both applicants and the leadership of the LJCPA Trustees to abide by the rules established by our community, the City, State and Federal Government.